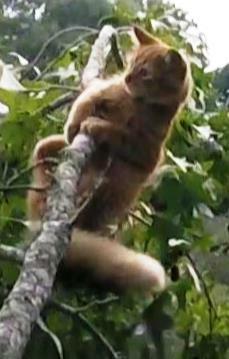 When Kathy and her family went to their camp recently, a small orange tabby kitten approached them. The kitten was cute and friendly, so they spent some time with it while assuming and hoping it belonged to someone nearby. They went back home but returned to the camp the next week, and the kitten was still there. This time, they decided they needed to take it home with them. Kathy convinced her son to take it and, perhaps, give it to his girl friend. The son named it Tahli and presented it to his girl friend, but she was not as thrilled about the kitten as everyone had hoped. Apparently, neither was the son, because, now, Tahli is living with Kathy. 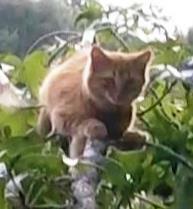 Tahli is only three months old, but he has already found himself stuck in a tree in the back yard. 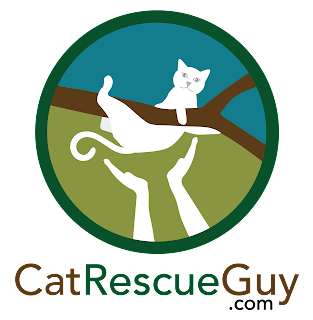 We don't know how it happened, but Kathy found him about 9:00 at night, and, after doing some research on the internet, she found me and called the next morning. We arranged to meet there later in the afternoon. 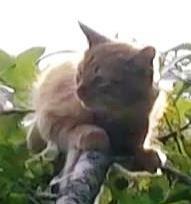 Tahli was 25 feet high in a small sweet gum tree, and he was sitting on top of the trunk where the top had broken off long ago. Since he was known to be friendly to strangers at their camp in the past, I was expecting him to be friendly to me in the tree. And he probably would have been had I not scared him so badly when installing my rope in the tree. The weighted bag that I used to install my rope got stuck in a long limb, and I had to pull it very hard to free it. As I pulled on the bag, it also pulled the long limb toward Tahli, and I created quite a bit of commotion as I jerked on the bag several times until it suddenly came free. When that happened, Tahli walked out a small limb on the opposite side of the tree to get away from that, and he was clearly scared. I had hoped that he would have calmed down a good bit by the time I climbed up to him, but, if he did, it was not enough. He was perched near the end of the limb about eight feet away and facing me while panting due to stress, heat and dehydration. He spoke to me, but he would not come any closer to me. I was as sweet and gentle as I could be to him, but he would not forgive me for scaring him earlier. I opened a can of food hoping that would change his mind, but he had no response to that at all. I then learned from Kathy that he has never had canned food before. So I called Kathy on my cell phone and had her talk to Tahli through the speaker phone as if she were in the tree in my place. Tahli did recognize and respond to her voice, but he still would not come any closer. If I could have installed my rope a good bit higher, I could have walked out that limb to get much closer to Tahli and make friends with him, but I did not trust the limbs above me, because they appeared to have sprouted from the top of the tree after the top broke off and were, therefore, more weakly attached. So, I chose to place my long-handled net behind him to nudge or scare him into walking to me. Once he gets close enough to me, then I will make friends with him and put him in the cat bag. I had to reach as far as I could to get the net in position behind him, and, as expected, he was not comfortable with that net there. He shifted his position a little, but he did not move. I pulled the net closer to him and even nudged his rear end, but he still would not move. Since he was not moving, I decided to slip the net under him and capture him in the net. As I slipped the net under his back feet, he stood up and began to lose his footing. 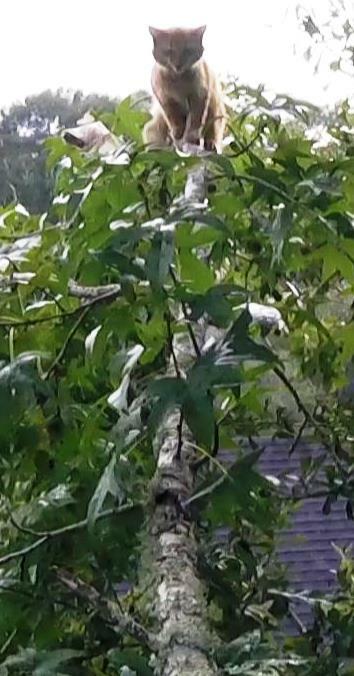 He fell to one side of the limb but was hanging on. I quickly moved the hoop of the net to the other side and under him, but the bottom of the net got hung up in the foliage on the other side of the limb. Instead of hanging freely below the hoop, the net was now stretched straight to one side partially blocking his entry through the hoop. Still, if I could get him to fall into the net, then his weight should pull the net down where it should be. Tahli managed to pull himself back up on the branch, and I had to put the net over him to prevent him from going all the way to the end of the branch out of my reach. I pulled him back toward me and tried to flip him off the limb into the net. He still managed to hang on to the limb, and I could not get him to fall into the net. As I struggled to maneuver the net in such a way to pull him loose, he lost his grip and, with the aid of the net still snagged and stretched taut under the hoop, managed to slide on his back over the edge of the hoop and out of the net. I tried to quickly move the net below him to catch him, but he fell faster than I could move it. He fell into the limbs of a different, smaller tree and came to rest on a limb there just ten feet below me but still ten feet from the ground. He stood there stunned and motionless. At this point, Brian, a neighbor who had come to watch, became my hero and climbed up the step ladder that was already out there from Kathy's earlier attempts to get Tahli down. He went up as high as he could and reached as far as he could and managed to grab Tahli and bring him down. Tahli was too tired and stunned to put up any resistance, and he came down calmly. Kathy let out a huge sigh of relief as she took Tahli in her arms and then carried him inside the house. I was so grateful that Brian was there and was willing and able to quickly step in and grab Tahli while he was still in such a docile state. Not only was that best for Tahli, it was also best for me. Otherwise, I would have had to go to a lot of trouble to move my rope to a better position to allow me to descend to Tahli's new position, and Tahli would have been more stressed by the time I got there. Thanks, Brian. You saved us a lot of trouble and brought our difficulties to a quicker end.